This article was peer reviewed by Dan Prince and Michaela Lehr. Thanks to all of SitePoint’s peer reviewers for making SitePoint content the best it can be! With each new release of AngularJS, the development team is trying to bridge the gap between AngularJS 1.x and 2. With the release of AngularJS 1.5, developers will be able to write applications structurally similar to AngularJS 2.0. In this tutorial, we’re going to create a grid directive in AngularJS 1.4. We’ll then walk through the steps to upgrade it to 1.5, and afterwards look at how we could convert it to work with version 2.0. As well as the Angular framework, we’ll also make use of Bootstrap to design our directive layout. We’re including both of these files direct from CDNs. Let’s create a simple grid directive to display a JSON array. We’ll start by creating an AngularJS module. We’ve defined a constant called employees that holds an array of example data. We then inject this array into HomeCtrl, and make it available on the controller’s scope. Let’s create a directive called myGrid, which we’ll use to display the above JSON array. Add the following HTML template script in body of index.html. As you can see in the code above, we are iterating over the info property and displaying each of the items in the employees list. See the Pen AngularJS 1.4 Demo by SitePoint (@SitePoint) on CodePen. So far we’ve created an AngularJS directive using version 1.4 and it’s working pretty well. Now, let’s try to use the same code with AngularJS 1.5 and see if any thing breaks. Let’s replace the existing script reference with a CDN link to version 1.5. If you try refreshing the page everything should continue to work fine. With this new release of the 1.x line, the framework is moving closer to the way AngularJS 2.0 will work, using components, and we can take advantage of this in our code making the eventual transition to version 2.0 easier. In AngularJS 1.5, components are syntactical sugar for directives which take care of the defaults and have a simpler configuration. They should be favored as a replacement, especially for those wanting to upgrade in future. When working with AngularJS, developers generally tend to work with controller-based approach, but this can create many problems as the application starts to grow. A controller and view based approach leads to repeated ng-controller/view, but a component-based approach solves the issue by creating components that can be composed into larger components without repeating the code. As seen in the above code, we have passed all the options that we had in our old directive. Create a component called myComp in the index.html page. Save the changes and refresh the page and you should be able to see that the data is not displayed but no error in the browser console either. 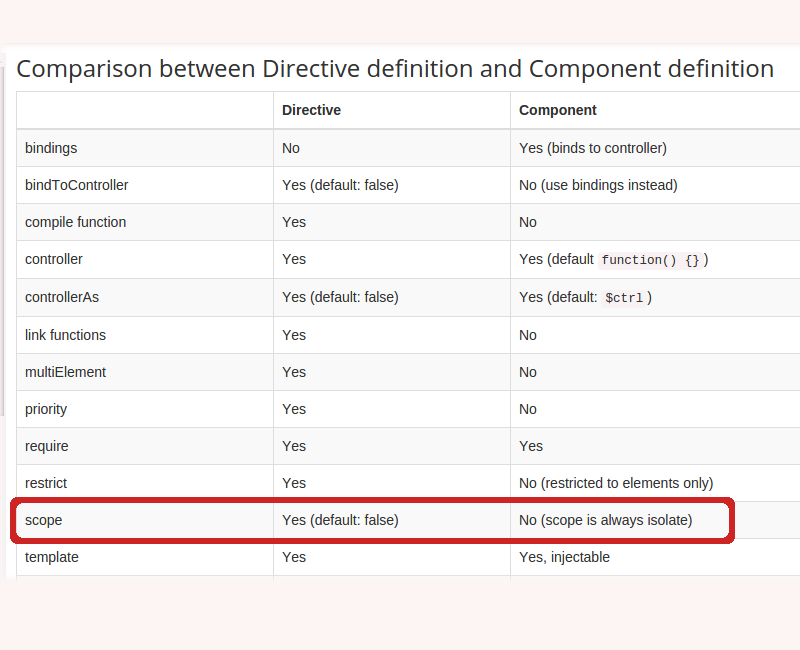 If we take a look at the comparison chart between the component and directive from the official site, we can see that scope is always isolate in components. So, we need to make use of the bindings option to bind data to the controller. The restrict option is no longer required, as components are restricted to elements only. Now if you refresh the page you should be able to view the data displayed using the myComp component. See the Pen AngularJS 1.5 Demo by SitePoint (@SitePoint) on CodePen. Note : AngularJS 2.0 is still in beta. The version we are using is Angular2.0.0-beta.8. After refreshing the page nothing shows up on the page and if we check the browser console we can see a couple of errors too. As you can see, our component code didn’t work well with Angular 2.0! Let’s start from the very scratch and see how the new version works, then we’ll try to port our component. Whereas it’s possible to get started with Angular 1.x by including the framework with a single script tag, the situation with Angular 2.0 has changed. We need a couple of other libraries in order to function. While loading these separately via script tags is OK for development, they are intended to be bundled up as part of a build process for production. If we take a look at the official quick start guide, we can see that we’ll need some other libraries and development dependencies to get started with 2.0. In the above code, we are using the Angular core namespace ng.core to create a component. We have defined a selector for our component as my-comp. We are using the same HTML, grid.html, as the template for our app. We have defined our employees object in the component’s constructor. This tells Angular to load the component that we just created. The above index.html page is the starter template for AngularJS 2.0 applications. We have included all the required dependencies, and within the body tag we have used our component. Save the changes and start the server using npm start. This command runs a local development server called lite-server that loads index.html in a browser. But still the data doesn’t show up! Save the changes and restart the server and you should be able to see the employees data displayed in the app. Components are a major part of AngularJS 2.0 and it would be right to say it’s component-based framework. With each new release of the 1.x line, we are moving closer to how applications are developed using version 2.0. In this tutorial, we created an AngularJS directive using verison 1.4 of the framework. We the refactored the directive to take advantage of version 1.5’s component syntax. Finally, we upgraded it to work with Angular version 2.0. For a more in-depth look at migrating your AngularJS apps, consider reading the official migration guide. Angular 2 code can also be written in TypeScript and Dart , and if you’re interested I would recommend reading the official guide to getting started with AngularJS 2 in TypeScript or Dart respectively.